SPRING Technologies has more than 25 years of experience in the PLM field (CAD / CAM, PDM, …). They develop their own product in Digital Workshop for simulation and optimization of machining on machines. They offer a wide variety of programs, but here we will mainly present the program for simulation and optimization of the NC code, which we send to the machine for further use. NC SIMUL MACHINE is the high end CNC simulation software module of NC SIMUL SOLUTIONS for G-code verification, machine simulation and toolpath optimization. It detects NC programming errors and any potential collisions from the same NC code that drives the CNC machine. Tool length optimization is a standard NCSIMUL feature. Reduction of bending phenomena as well as collision risks with the tool support (attachment + extensions). Suppression of the collisions with the tool support as well as reduction of the tool bending. Thanks to OPTITOOL, the NCSIMUL MACHINE user can define its own approach and retract motion parameters in order to minimize the air cutting and maximize the use of rapid motion (or working feedrate with high speed). With over 20 years of R&D, the NC SIMUL G-code verification technology has become a combination of the highest performance simulation software available on the market. They have standard for “ease of use” in today’s software offerings. Available for turning, drilling, milling (3 to 5 axis), multi-tasking or even more complex machining. NC SIMUL MACHINE is the most advanced machining verification software for simulating, verifying and optimizing CNC programs. Based on the real characteristics of your CNC machine, the result is a dynamic verification software that includes the exact environment for all machines, tools and materials. Collaboration in the workshop is also possible thanks to an embedded function that generates CNC technical documents, which can be shared and reviewed, along with the simulation, on NC SIMUL player. 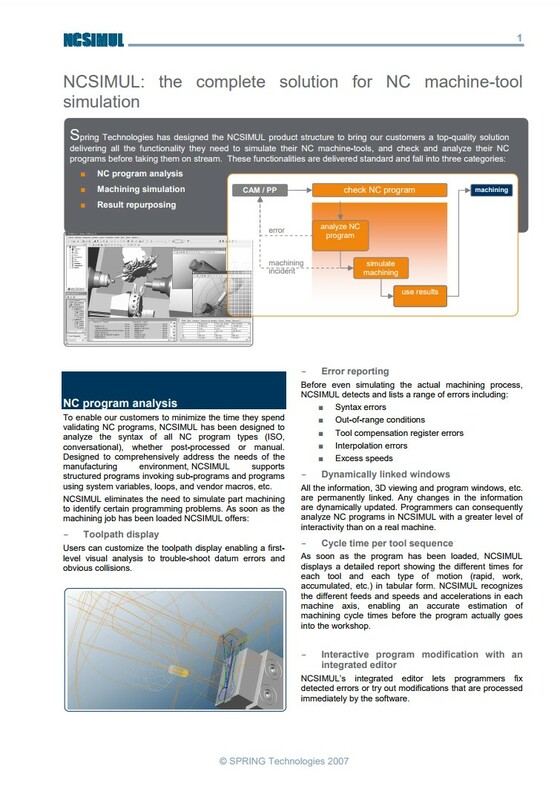 NCSIMUL MACHINE is available as a standalone software, scalable to your needs. It facilitates your CNC verification process and tightly integrates your IT system through CAD/CAM interfaces. One of the key benefits, for example, is that any existing CAM data can be seamlessly imported into the software, eliminating the need to rebuild tool libraries. 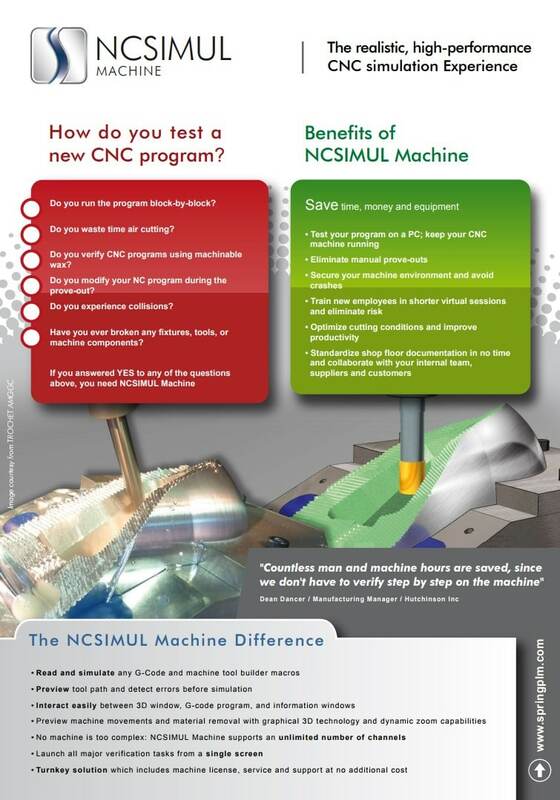 If your company runs CNC machines, such as 5-axis or more complex machines, seriously consider NCSIMUL MACHINE. It saves time and money with better quality results.